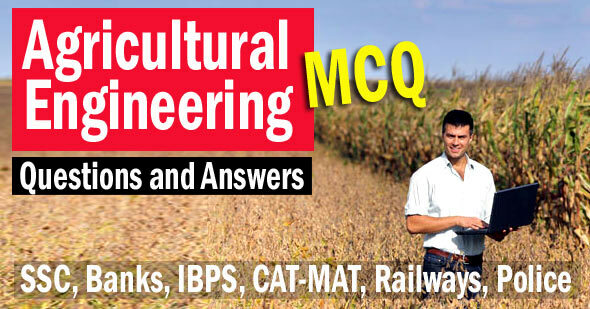 Agricultural Engineering Multiple Choice Questions and Answers: Most important Agricultural Engineering Objective Questions and Answers useful for General Agriculture for preparation of SRF, ARS, Ph.D., M.Sc. IBPS, AFO, AO, IFS, NABARD, SSC, Banks, IBPS, CAT-MAT, Railways, Police & many more competitive examinations & entrance tests. (C) M/ s Eicher t..ractors Ltd.
13. A tractor seat suspension should have its natural frequency in the range of ___ CPC. 25. If the exact speed ratio does not require, which combination of teeth on a spur gear be preferred? 30. The Lowest unit draft is obtained in a disc plough, when disc is operated at ........... depth of its diameter. 38. For operating rotavator in trashy soils, which lines are better? 45.Farm yard manure contains about ................ percentage of nitrogen.